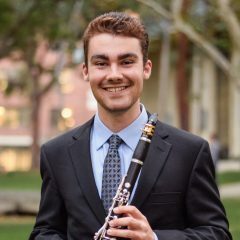 Clarinetist Max Opferkuch, an undergraduate at USC Thornton and the principal clarinetist in the student-run USC Concerto Chamber Orchestra, won the Grand Prize of the 33rd Pasadena Showcase Instrumental Competition. As part of his prize, he received $6000 to support his studies. The showcase for string, woodwind and brass music students from Southern California aged 16-24 is judged by a panel of musicians from the Los Angeles Philharmonic.